Experience a feast for the senses with a visit to this national treasure, a cultural melting pot near the country's southern border. At Tumacácori National Historical Park you can enjoy the reflective calm of silent buildings, strong colors of fiestas, spicy flavors and scents of local foods, ancient rhythms of native music, and the warmth of Arizona's sun. I remember my first visit to the park. It was a comfortable, hushed afternoon. My husband and I wandered Tumacácori mission grounds. While he photographed plastered adobe buildings, I spied intriguing Mexican borderland birds through my binoculars. In the bookstore, we bought a book about Spanish missions and a CD featuring energetic Mexican tunes. As we left, my husband turned to me and suggested that I might like to work here someday … and I agreed! When I became a ranger at Tumacácori, I learned more about this region that is variously known as the O'odham homeland, New Spain's northwestern frontier, northern Mexico (prior to the Gadsden Purchase), and the southwestern United States. 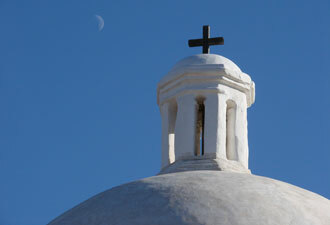 In 1691, Catholic missionary Padre Kino accepted an invitation and became the first European to visit the O'odham village, later known as Tumacácori Mission. Here you can discover evidence of what he and others brought from around the world, from the Catholic religion, to the Spanish language, and Mediterranean architectural style. In the park and in its museum, you can see examples of old world species they imported — livestock, crops, and fruit trees that infused the rich native culture with more dining options. Times were not always easy; there were revolts, devastating epidemics, an expulsion of Jesuit priests, and influxes of people from outside the region. Tubac, a Spanish soldier garrison, was established nearby and offered protection from some Apaches who had formed raiding parties. In 1775, a Spanish-sponsored expedition composed of 300 people and 1,000 livestock passed through the mission. Led by a Tubac captain, Juan Bautista de Anza, they were enroute to settle an outpost at what became San Francisco. You can visit Tubac Presidio State Historic Park, three miles north of Tumacácori, and easily follow the expedition's route since it is now a national historic trail. In 1848, mission life became impossible because of the Mexican-American War cutting off supply routes, an increase in Apache raids, and a severe winter. 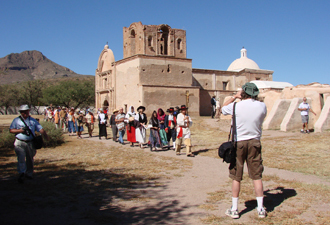 The community made the difficult decision to leave Tumacácori, taking their valuables with them to Mission San Xavier del Bac. After sixty years of deterioration, President Theodore Roosevelt established Tumacácori National Monument in 1908, protecting the mission's remains. While the people of the mission left, they did not disappear. 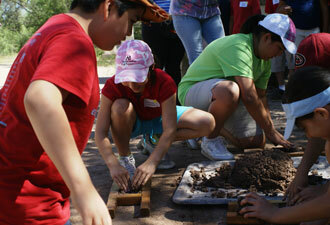 Many area residents can trace their roots to inhabitants of the missions. The region's mixing pot culture is still alive and evolving; it continues to bubble and boil and incorporate flavors of today's world. Today, the past and the present meld together as one at Tumacácori National Historical Park. Come experience it!